Train classification in Ukraine differs from European one. 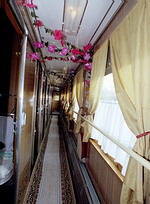 Carriages and cabins do or do not have some usual for European or American traveler amenities. To serve you better, we have made a Ukrainian Train Guide with some simple and detailed classification. Express Trains. These are the best trains, usually going overnight between big regional centers of the country. Those trains make quite a few stopovers en-rout, have carriages of good quality and OK service. Express trains usually have 1st, 2nd and 3rd class carriages. Some of those trains include 1st class carriages for peak seasons, and exclude them for the rest of the year. Express train numbers vary from 001 to 149.
sleeping berths. Short distance travel might take up to 6 hours, while going by car would cut the time twice. Train Carriages. Carriages' classification in Ukraine differs from European standards. There are 5 types of carriages on the trains in Ukraine: SV (sleeping wagon), coupe (compartment), platzcart, common wagon (with numbered reserved seats), sit up (on suburban trains). For convenience we have put classification - 1st, 2nd, 3rd and 4th class. 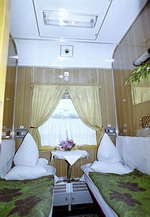 1st class, (SV), sleeper. This is the best type of carriages in Ukraine. Every carriage has 9 cabins, 2 berths in each cabin. Beneath the lower berth(s) there is a box for luggage, which can accommodate 1-2 medium bags. Bigger storage for luggage is in the niche above the door. There is a small unfolding table by the window. Every cabin has a door lock and can be locked from inside. Each carriage has WCs with wash-stands, 2 per each carriage. 1st class cabins are air-conditioned at the summer time. Air-conditioning is functioning while the train engine is working. Therefore it might be rather hot in the first hour or so of the trip and when the train is making stopovers. One or two stewards serve every carriage. 2nd class, (coupe), sleeper. 2nd class is usually quite acceptable type of carriages. The quality depends on a train. Each carriage has 9 cabins, each cabin has 4 berths - 2 lower and 2 upper ones. There are boxes for luggage below lower berths. Bigger storage for luggage is in the niche above the door. There is a small unfolding table by the window. Every cabin has a door lock and can be locked from inside. 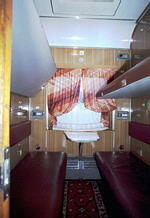 2nd class cabins in Express trains are usually air-conditioned but not always. Each carriage has WCs with washing-stands, 2 per each carriage. One or two stewards serve every carriage. 3rd class, (platzcart), sleeper. Not the best choice. Each carriage has 54 berths, among which 36 berths of normal type (in cabins) and 18 side located (along the passageway). 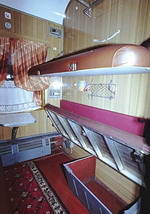 Berths are in two levels. Cabins have no doors and cannot be closed. There are boxes for luggage below lower level berths in cabins, and small luggage niches below side located ones. Under the upper level berths there are small berths for storing the luggage. Each carriage has WCs with washing-stands, 2 per each carriage. One or two stewards serve every carriage. In spite of very low quality of 3rd class carriages they are popular in Ukraine, the reason is their very low tickets price.